Home » Tips & Tricks » Hair Care » Which Cibu Ancient Serum Argan Oil is best for you? Between the environmental elements and styling regiments, we can really stress our tresses! The best line of defense against dull, dry hair is a quality shine serum from Cibu. But which one is best for your hair type? We've taken the guess work out with our top pick for each hair type so your hair will look it best! The cornerstone of Cibu is the Ancient Serum line of products. All of the serums contain Argan oil. Since Argan oil is full of vitamins and antioxidants, it is beneficial for repairing damage caused by coloring and straightening treatments, hair care tools, and even the sun. But not all serums are the same, so let's breakdown which one will be best for you. This lightweight serum is ideal for blondes and fine hair types. Yes, you too can achieve glorious shine without a heavy serum to weigh down your locks! 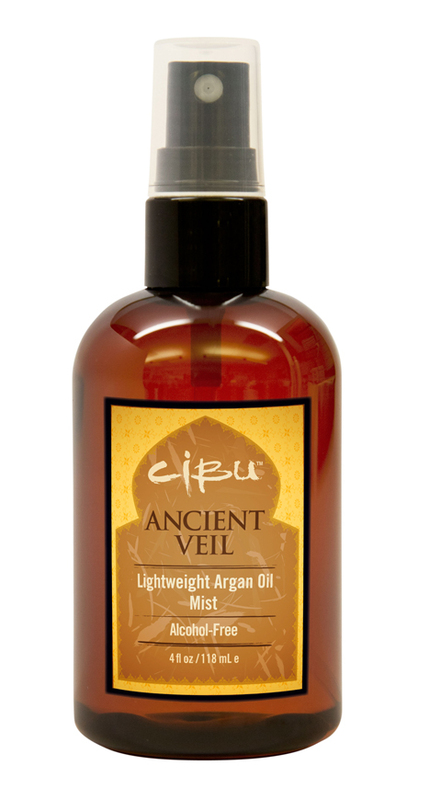 Cibu Ancient Veil is a feather light mist formulated to add shine and nourish your hair. Just spray on wet hair from the mid-shaft to the ends and work into strands with a wide tooth comb. Ancient Veil provides heat protection, so your hair will feel so silky and healthy after you blowdry. You can also apply to dry hair to touch up any frizzies or add additional shine. For normal to dry hair, this is our staple serum! In fact, just one pump of Ancient Serum benefits hair by nourishing and repairing damaged hair, enhances shine, eliminates frizz and protects hair from heat damage! Plus, you can add a pump or two into your weekly hair mask for extra shine and softness. And the benefits don't stop there! Argan oil is wonderful for skin as well. Try adding a drop or two into your facial cream and hand/body lotion. This will keep skin extra soft and smooth during dry months. You could also used Ancient Serum to remove eye makeup and to soften cuticles. Cibu Anicent Serum is truly multi-useful and a little sure goes a long way! Introducing the newest member to the Cibu Ancient Serum family, Anicent Serum + Keratin Intensive Treatment Oil is ideal for medium to coarse hair types. This serum is a protein packed powerhouse infused with hydrolyzed keratin protein to repair, strengthen, nourish and smooth damaged hair cuticles. And for a limited time, save $3.00 on your purchase of Ancient Serum + Keratin available now at all Hair Cuttery salons or order online at www.cibuforhair.com and enter ANCIENT3. Hair Cuttery is proud to carry Cibu, which celebrates 10 years of producing excellent hair care products. Ask your stylist about any of the Cibu products we carry or learn more on Cibu's website where you can order online.